So large a national icon is Delia Smith in the United Kingdom, that the wonder is that she remains unknown across the pond in America or Canada. She focusses on British classics, while being open to new approaches and ingredients. Her focus has mostly been to raise the fundamental standards of everyday cooking by educating people about the basics, step by step. Her word became law on how to do particular tasks in the kitchen. “Doing a Delia” is a phrase that means you are doing something exactly as she had instructed it to be done. When she recommend a food or kitchen item, supermarket shelves get ransacked for it throughout the UK. 1941 — Delia was born 18 June 1941 in Woking, Surrey. Her mother’s name was Etty Smith. Delia grew up in Bexleyheath, Kent and went to Bexleyheath School there. 1957 — She left school at the age of sixteen without a single qualification. She trained as a hairdresser, then worked in retail as an ordinary shop assistant, then worked at a travel agency. 1962 — At the age of twenty-one, she got a job in a small restaurant in the Paddington area of London called “The Singing Chef”, owned by Leo Evans. She washed dishes and and served tables. That got her interested in food. She started studying cooking books at the British Museum. 1963 — Delia had been baptized Church of England, had gone to Methodist and to Congregationalist churches, but at the age of twenty-two, she converted to Catholicism. During the mid 1960s, she boarded with a family on Harley Street in London. 1972 — Delia begins writing for The Evening Standard in London. She would write for them from 1972 to 1985. 1973 — Delia starts teaching cooking on a TV series for BBC1 called “Family Fare.” The series ran until 1975 . Around this period, she also became a food columnist for the BBC’s Radio Times, which she continued until 1986, and got a job helping to make a TV food commercial. Just before they started filming the commercial, she stepped in and whipped up a pie when one needed for the shoot was dropped on the floor. 1978 — Delia does “Delia Smith’s Cookery Course: Part One”, through BBC Further Education, on TV and through accompanying books. The “course” went on to have three parts. 1980s — Delia publishes a string of books. 1990s — There was no book or TV programme she could do that wouldn’t be a huge success, often breaking sales records. 1993 — Delia started consulting for Sainsbury’s grocery stores. She and her husband establish “New Crane Publishing Limited.” Through it, in May of this year, they launched Sainsbury’s (Food) Magazine for the store. This formal, frequent association with Sainsbury’s lasted until 1998. In the same year, she did “Delia Smith’s Summer Collection” on BBC 2, a ten-part series. The photography for the accompanying book was actually done in Provence by Peter Knab at his placed called “Le Baou d’Infer” twenty minutes outside of St. Tropez, where the light is more dependable. Delia was present, with her food stylist doing most of the cooking. Peter Knab would later do the photography for the Winter Collection as well. 1995 — She did the “Delia Smith’s Winter Collection”, a twelve-part series on BBC 2 TV, along with an accompanying book. In “Winter Collection”, she mentioned cranberries, causing a run on them across the UK, with sales spiking up by 30%. In the same year, she received the Order of the British Empire from the Queen. 1996 — Delia received several more honours: an honorary university degree from Nottingham University, a Fellowship from St Mary’s College at the University of Surrey, and a Fellowship from the Royal Television Society. 1998 — Delia launched her “How To Cook” ten-part series on BBC 2, taking everything back to basics, covering items such as boiling eggs and potatoes. She said that no one knew how to boil an egg anymore, as cooking had dropped out of most school’s curriculums. Other TV cooks such as Gary Rhodes said at the time that she was insulting the intelligence of viewers in dedicating one episode to how to boil an egg. Yet, with Delia having shown people how to cook an egg, egg sales rose that year 10% across the United Kingdom. She also mentioned a particular small aluminum frying pan (called the “Lune Metal”) as being fabulous for omelettes. It was made by a family firm in Lancashire that put out about 200 of them a year. Four months after the TV series, they’d received orders for 100,000 of them. 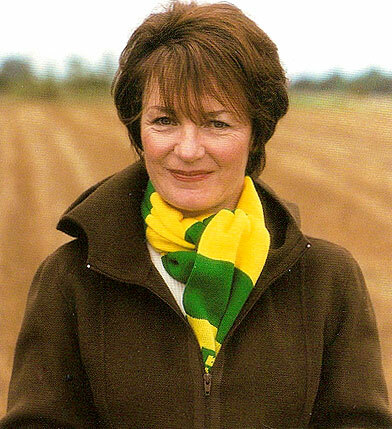 1999 — Delia received an honorary university degree from the University of East Anglia, and started catering at the Norwich City Football Club. 2000 — Delia received a fellowship from John Moores University, Liverpool. In November 2007, Delia Smith announced that she would be returning to TV to do a cooking series for the BBC. 2009. Delia is awarded a CBE (Commander of the British Empire) in June 2009, receiving it in a ceremony at Buckingham Palace in November of that year. 2009. Delia Through The Decades. A five-part series on BBC. ”I used to have a mini-skirt on. If I did waitressing and I couldn’t pull the cork out of the bottle, I would put it between my ankles like this – and I used to get told off because I had a mini skirt.” — Delia Smith: boss told me off for short skirts. London: Daily Telegraph. 4 January 2010. “I was just a jobbing cook who did food photography for advertising. It was just a phone call saying ‘Come to the studio, we need a very gaudy cake’. I didn’t know what it was for.” In “Delia Smith awarded CBE.” London: Daily Telegraph. 20 November 2009. Allen, Vanessa. Delia Smith confesses she flashed customers while she worked as waitress in the 1960s. London: Daily Mail. 5 January 2010. Conlan, Tara. Delia and the great rice pud flop,by her mum; How Britain’s favourite cook got her recipes wrong as a girl. London: Daily Mail 24 April 2001. Diski, Chloe. Swapping London fashion for Provençal food. London: The Observer. Sunday, 9 March 2003. Barkham, Patrick. The Guardian profile: Delia Smith. London: The Guardian. Friday, 4 March 2005. Hunt, Liz. Delia Smith rises like a soufflé. London: Daily Telegraph. 10 March 2009. Pierce, Andrew. Delia Smith is made a CBE. London: Daily Telegraph. 13 June 2009. Poulter, Sean. Delia Smith and Heston Blumenthal to star in £10m Waitrose advertising campaign. London: Daily Mail. 4 March 2010. Watson-Smyth, Kate. Chef laughs off verbal mauling by ‘bitchy’ Delia. London: The Independent. 26 September 2000. Reynolds, Nigel. Delia Smith to return to TV kitchen. London: Daily Telegraph. 21 November 2007.